What better way to honor the legendary soprano Marcella Sembrich than by nurturing the next generation of singers and inspiring their careers! 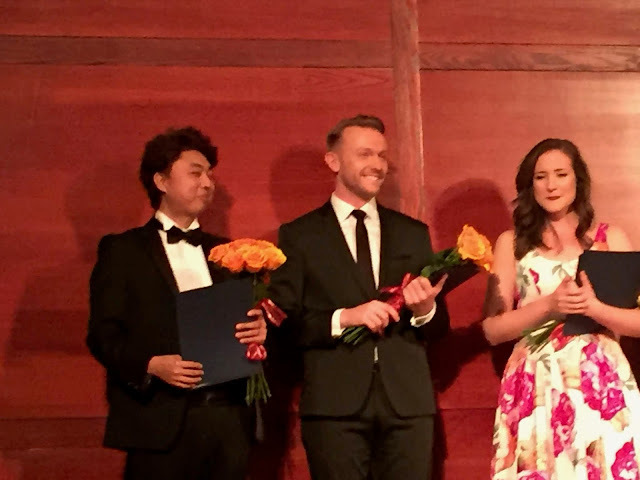 Under the artistic direction of another wonderful singer Edyta Kulczak (review of her recital can be found through the search function on this blog), this year's competition, sponsored by the Kosciuszko Foundation, drew entries from all over the world. We were fortunate to attend the finals yesterday and were impressed by the quality of the final round singers. If only there were more days in the week we would have happily attended the semi-finals. Top three prizes were awarded to soprano Alexandra Nowakowski, baritone Hubert Zapiór, and tenor Woo Young Yoon. Each contestant sang two songs; this is a very good idea because versatility is important and there is rarely a single song or aria that can show off the artistry and strengths of any individual artist. Ms. Nowakowski, heard and admired last year at the Gerda Lissner award recital, has a pleasing vibrato that lent special impact to a song by Paderewski entitled "Gdy ostatnia roza zwiedla". We don't often get to hear Polish songs and enjoyed the way in which the melody followed the sound of the text. Yet, it was the subsequent aria "O luce di quest' anima" from Donizetti's Linda di Chamounix that got us to sit up and take notice. We were impressed by her bright coloratura sound and the accuracy of her fioritura, not to mention her charming stage presence. She received all the applause deserved by her excellent performance. Mr. Zapiór has captured our attention all year and we have not missed a single opportunity to review his performances. He has made quite a splash in New York City and has been garnering awards left and right. Accompanied by Katelan Trân Terrell, one of our favorite collaborative pianists, he gave an unforgettable performance of Figaro's aria from Rossini's Il Barbiere di Siviglia. This aria offers the baritone an opportunity to create a memorable character, one who is a man of many parts, as they say, and just a touch full of himself. No two baritones sing it exactly the same way; we loved the way Mr. Zapiór colored his voice differentially when he spoke of the ladies and when he spoke of his gentlemen clients. His eyes sparkled and his gestures were generous. We wanted to become his client that very minute! To add to the interest, the patter part was perfectly realized--rapidly but with no loss of clarity. Bel Canto is Mr. Zapiór's strong suit and we loved the way he sang "Ah!, per sempre...Bel sogno beato", Riccardo's aria from Bellini's I Puritani. There was legato to spare, some gorgeous melismatic measures, and warmth of tone. Mr. Yoon dazzled the audience with "O Wie Angstlich", Belmonte's aria from Mozart's singspiel Die Entführung aus dem Serail. We noticed that this artist sets up each aria well. It is clear that he knows what his character is about and what the text has to say. He imbued the aria with plenty of dynamic variety and kept it interesting. His second selection was "Ah mes amis" from Donizetti's comic charmer Fille du Regiment. He had all the right gestures and readily established the lovability of his character whilst hitting all the high C's. To put a "plus" on this "A" performance, we would like to see him ease up on those high C's and trust them more. And one other little thing--although his French was quite good for the most part, a little tweaking of the pronunciation of the word "main" would be helpful, since the word occurs several times. The other three singers were superb and we would have hated being in the position of those esteemed judges. Particularly admirable was soprano Hayan Kim whose poignant "Piangeró la sorte mia" from Händel's Giulio Cesare was a real heartbreaker. Her bright expressive instrument was stunning in its legato; in the cabaletta there was astonishing fire. She is a master at using dynamic variation and we loved the embellishments in the return of the slow section. Moving from the 17th c. to the 20th c. she performed Sophie's aria "Ich bin ever liebden" from Richard Strauss' Der Rosenkavalier. She just melted our heart with Sophie's adorable sweetness! We thought it the perfect role for her. Megan Moore, new to us, sang a melodic Polish song by Moniuszko-- "Powiedzcie mi", making us wish we understood the language or had a translation. She followed this with "This Journey" from Jake Heggie's Dead Man Walking in which the nun asks her god for guidance. Her diction was impeccable and we understood every word. Perhaps, however, singing in English is not the best way to show off a singer's gifts. Daniel Miroslaw, heard and enjoyed many times at Juilliard, performed a fine Tchaikovsky song "Blagoslovlyayu vas, lesa" (I bless you forest!) with a deep resonance and interesting texture. In "La calunnia" from Rossini's Il Barbiere di Siviglia, he created a very pompous Basilio for us, employing comedic skills with the excellent pianist Brent Funderburk echoing the humor in the piano. Not only do the winners receive generous cash prizes but they also are given recitals in Poland. The audiences in Poland are in for a treat!